The WAJ2113.FT6015 TAG Heuer Aquaracer 500M Calibre 5 Full Black Men’s Watch is part of the latest addition to the Aquaracer line, and was recently debuted at the Basel Fair in Switzerland. This striking diving watch is not yet available to the public, but is sure to be a hit when it is released in September of 2010. The Aquaracer 500M Calibre 5 Full Black is housed in a black PVD coated titanium case. It has a black rubber unidirectional bezel that has a black “soft touch” coating. A matching luminescent marker is placed at 12 o’clock. 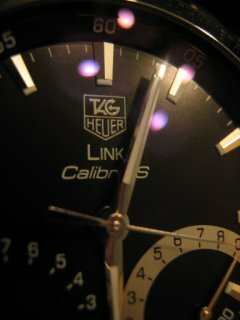 The watch has a black rubber strap that has a titanium clasp that has an embossed TAG Heuer logo. It has an automatic helium valve at 10 o’clock; a scratch-resistant, anti-reflective sapphire crystal; and a smoked sapphire crystal case back. The watch is water resistant to 500M.